The Stadion Energa Gdańsk, previously called the Baltic Arena and PGE Arena Gdańsk, is a football stadium designed by RKW Architektur +. It was built as one of the designated venues for the finals of Euro 2012 football championships, but is now used mostly for football matches. It is the home stadium of Lechia Gdańsk, currently playing in the Ekstraklasa. 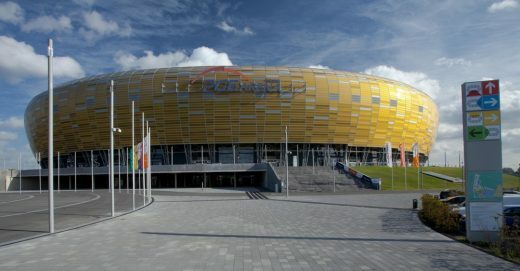 The Stadion Energa Gdańsk measures 235.88m in length by 203.51m in width, is 45.20m high and has a capacity of 44,000 spectators. There is a closed building under the west tribune for visitors and VIP guests to the stadium as well as various facilities for players, coaches, referees and hospitality, deliveries and function rooms that are required for football competitions. 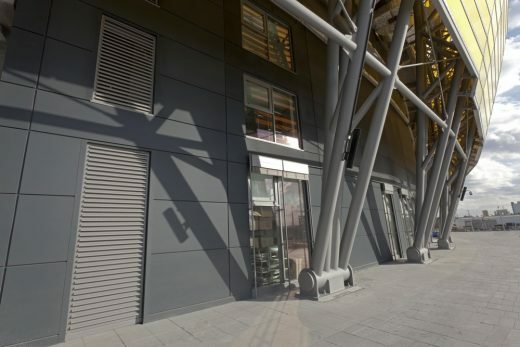 Trimo’s Qbiss One façade system takes centre stage directly at the front of this building, under the stands, with an area of approximately 3,975 sqm. RKW Architektur + required a wall system which had strong technical properties. As the stadium is a public building with high commercial use, fire safety, insulation and acoustic performance were critical specifications to be met. In addition to this, the stadium needed to be aesthetically pleasing from the exterior. The architects had a specific colour design in mind, and therefore needed steel elements which could be customised to suit the specification. RKW Architektur + wanted the stadium to visually resemble amber, which has long been an important symbol of the area being extracted on the Baltic coast. Consequently, they required a striking, versatile system with vividly contrasting colour tones. RKW Architektur + called on Trimo to deliver architectural solutions for their vision. Trimo technicians worked with RKW Architektur + to provide accurate and comprehensive insight into the technical information of its façade solutions. 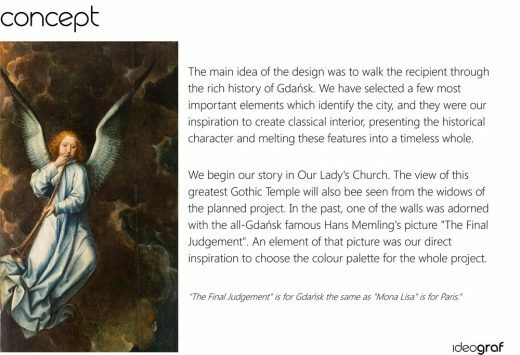 From the architect’s brief, Trimo’s team was able to ensure precise, timely and quality technical information was supplied to align with the project specification. At design stage, Qbiss One B was identified as the façade system of choice. Qbiss One is differientiated by its unique and patented rounded corner element, which eliminates the need to cut, weld, or fold the element. This stood out to the architect as an advantage over conventional metal rainscreens. possibilities and allow constructions that are truly individual. RKW Architektur + chose a horizontal installation; Trimo’s most classic and commonly used orentiation type. It is a modular façade system composed of individual elements, joined in the horizontal direction with a tongue and groove stack system which is fixed to the supporting structure in a vertical direction. RKW Architektur + then worked with Trimo to establish the steel colour of choice. With Qbiss One’s great colour flexibility, the architect was able to meet their vision, by selecting Trimo’s ‘Grey Anthracite’ shade. Qbiss One partners with Colorcoat Prisma® by Tata Steel to offer ultimate corrosion protection and up to 30 years Confidex® Guarantee. Qbiss One stands out to architects and specifiers as a complete all-in-one prefabricated wall solution. It can be fixed directly on to primary steel work, or lightweight-gauge steel frame, or solid wall. As components are built in a controlled environment, Trimo was able to offer a higher quality solution, which resulted in a cost and time effective installation process for the client. It also deterred the need for RKW Architektur + to consider brick or concrete walls, additional insulation, vapour and wind protection or additional secondary sub-construction. As a class A1 non-combustible material, mineral wool also does not add energy to a fire. The entire wall system has an A2 classification and assures at least two hours fire resistance, with a thickness of 133 mm. Non-combustible insulation materials, such as mineral wool, do not emit toxic smoke, which is acknowledged to be the major cause of death in fires (as opposed to the fire itself). Qbiss One elements have been tested in accordance with the Building Research Institute and meet all the requirements for fire protection as laid down by the PSP. RKW Architektur + could also rest assured that Qbiss One facade systems have been tested and approved to Factory Mutual (FM 4880, FM 4881) and Loss Prevention Certification Board (LPS 1208), standards to comply with property insurers risk requirements. Trimo’s technical team worked efficiently with RKW Architektur + to achieve the specification goals of the projects. Not only was Qbiss One the perfect technical solution, the versatility of the system was a settlement for the client’s needs.